Yet for many brands, the email creation process is an afterthought. In general, marketers focus way too much on acquisition and not enough on retention. They optimize for search engines to get found, social media for clicks, and on-page elements to generate conversions. But after the conversion, optimization tends to fall off both in strategy and execution when it comes to email delivery. This lack of focus tends to lead to the “spray and pray” method of email marketing, and lame personalization tactics like “Dear [first_name]” in an attempt to make up for it. Joe Pulizzi and his team at Content Marketing Institute have a much different approach. 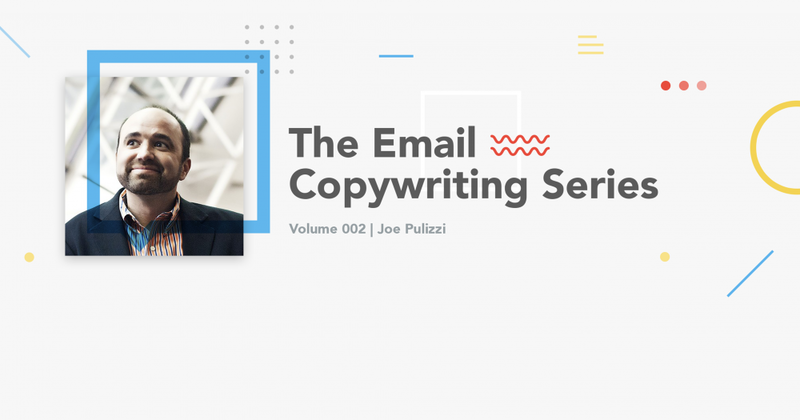 Pulizzi, founder at CMI, is an author, speaker, and evangelist on all things content marketing. His latest book, Content Inc., details how entrepreneurs are leveraging content to build massive audiences, even before they have anything to sell. His views on developing a content marketing mission statement not only apply to the content we produce on blogs and other publications, but also in the content we send via email, too. That was the focus of our conversation for the latest installment of The Email Copywriting Series. Q: The digital marketing landscape is centered around email. Marketers base their interactions around collecting emails for leads and customers, so how do marketers create a mission that ties everything together? Email is the most important channel, because it’s the one we have the most control over. What we’ve got to remember is that we’re hopefully talking to one specific audience. And if we’re to look at what the content marketing mission is, and where we start—why do we even look at that? Well, look at the greatest media and publishing launches of all time, or any media company that launches a product—it always starts with an editorial mission to keep them on track and use that as a litmus test to measure any content created around the overall mission statement. Who is the particular audience? You want to be very specific with that one particular audience. Let’s say you’re targeting engineers—you’ve got to make sure you’re not sending your email to plant managers, chief financial officers, etc.—you’re just talking to engineers, and hopefully even more specific than that. What are you going to deliver? Is it simple tips? Something hyper-specific that’s going to help them with their job in some way? Is it more complex answers? Is it audio content? Visual? Textual? Outcome? What’s in it for the audience? If you can be specific about what’s in it for the audience, do you know how far ahead your editorial and email creation team will be? If you don’t do that, then the person creating the content may not have a very good lense for what they’re trying to accomplish. Are you trying to help them live better lives? Get better jobs? What’s the specific outcome for the audience? Create that content marketing mission statement, and if you do that, what we’ve found with our content marketing benchmark research is that you are twice as effective as the brands that don’t. Q: Speaking of outcomes, many marketers focus on opens, clicks, etc., and these are very brand centric. So how does a marketer go about measuring the effect and the outcome of a user at a more existential level? I’m going to be very different here because I have a very different take on how we look at our email subscribers. The first time we get someone to subscribe to our emails, I’m not going to be selling them anything. Our research tells us that we want our subscribers to be engaged with at least three things that we offer from a content perspective. So let’s say someone subscribes to our email newsletter, and then they subscribe to our magazine and a webinar. Our numbers tell us that someone engaging with at least three different content pieces are way more likely to pay for one of our services. Of course you want subscribers opening and engaging with your emails, but what I’m looking at is, have they said ‘yes’ three different times. If I can get someone to subscribe to three different things, they behave much differently than someone who only subscribes to our newsletter. Of course, I’m not an email marketer per se, I’m a publisher from a media background, so I always look at how behavior changes across different engagements. We always talk with the team about, you’re an octopus, you want to wrap your audience in content. We want to cover the three legs of the stool: digital, print, and in-person events. We want to engage across three different platforms with content in some way, and email is always the start of that. But it’s just the start. We’re going to build the relationship from there and get them involved and opted in to other content initiatives we’re doing. Q: In Content Marketing Inc., the main theme is about building the audience and platform first. So publish and share content before you really have anything to sell. Once that’s built and established, it’s much easier to sell. What has this model looked like for Content Marketing Institute? It was really a happy accident. It was really weird, because when I launched what is now Content Marketing Institute, we didn’t have any products or services to sell. So we thought, “we’ll just blog three times a week”, and we started to generate subscribers for a weekly newsletter, which was our first offering. We had a blog and newsletter, and really that was it. We just kept delivering value and what happened over time was, subscribers started to know, like, and trust us as an organization. When we were ready to launch our products and services, our subscribers were already very open and trusting to us. We already had the credibility and the authority in the industry and they were ready to buy. This is where most people miss the boat. They try and get the email and sell right away, but the relationship has just started. What we’ve found, by waiting until the relationship is built over time, is that subscribers are more willing to buy from you later. Q: What’s more important—a massive database of email addresses, or a smaller list with high brand equity? So my take is that if you do not have a super valuable content asset, in that if it’s not the one place where subscribers get their information, then you’d need quantity. You want as many as possible, you’re going to play the numbers and percentages, you’re going to forecast opens and click throughs and figure out your formula. But let’s be realistic, that’s not what we want. We want to create credibility with the right people and do the least amount of work for the most amount of impact. Look at what The New York Times has done. They’ve launched tons of targeted newsletters that are specific to a lot of their column authors, and they’re seeing open rates as high as 50-70%. Wouldn’t it be better to have a variety of email offerings that are really focused and super valuable that people really want to open than having one massive list? Be specific about the outcomes your subscribers should experience as a result of reading your email. Are you trying to help them live better lives? Get better jobs? Identify your engagement number, which is the amount of content your subscribers need to consume before they are ready to buy, and focus your email strategy on delivering on this number. If you’re building or launching a new product, focus on building your audience by creating value in your initial content + email offerings. Sales come easier after that. Send a variety of email offerings that are really focused and super valuable instead of sending blanket emails to one massive list.